Be the first to share your favorite memory, photo or story of Angeline. This memorial page is dedicated for family, friends and future generations to celebrate the life of their loved one. 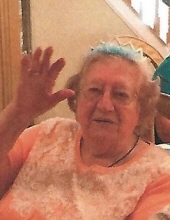 Angeline R. Schwartz (nee Esposito) of Marlton (formerly of Cherry Hill) NJ, passed peacefully on March 20, 2019. Age 91. Beloved wife of the late Michael Schwartz. Loving mother of Michael Joseph Schwartz (Eileen); Joseph M Schwartz (Debra Smith) and the late Debbie Schwartz. Devoted grandmother of James Schwartz (Melanie) and the late Matthew Schwartz; Michele Keefe (Andrew), Michael (Jenna) and Catherine Schwartz. Devoted great grandmother of Mackenzie Schwartz, Andrew and Samuel Keefe. Aunt to numerous first and second generation nieces and nephews. Angeline "Angie" was born and raised in the Merchantville/Cherry Hill area. At age 23, through a mutual friendship, she was introduced to her future husband, Mike, and they would marry and reside in the Cherry Hill area while raising their two sons, Michael, Jr. and Joseph. Angie's greatest love and passion was the time spent with her family and friends. In addition to being an avid Philly sports fan, she loved to garden and with her great joy for cooking and entertaining, her home quickly became the central gathering place for friends and family. Her husband, her children, and her desire to be surrounded by those she cared for the most, quickly became the pillars to the foundation of family life that became her priority in life. Visitation Monday 10 to 10:45 am in Christ Our Light Church, 402 N. Kings Highway, Cherry Hill, NJ 08034. Mass of Christian Burial Monday 11am. Interment Calvary Cemetery, Cherry Hill, NJ. In lieu of flowers, donations may be made to Make-A-Wish Foundation, 1347 Perrineville Road, Monroe Township, NJ 08831. To send flowers or a remembrance gift to the family of Angeline R. Schwartz, please visit our Tribute Store. "Email Address" would like to share the life celebration of Angeline R. Schwartz. Click on the "link" to go to share a favorite memory or leave a condolence message for the family.